Elizabeth Adela Stanhope Forbes (1859-1912) - was a Canadian painter who was primarily active in the UK. She often featured children in her paintings and School Is Out (painted in Newlyn) is one of her most popular works. She was friends with the artists James Abbott McNeill Whistler and Walter Sickert, both of whom influenced her work. 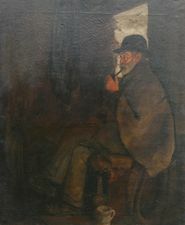 Her etchings in particular are said to show the influence of Whistler. After studying and working in continental Europe, Forbes settled in Newlyn, England where she raised her son and established a school with her husband, Stanhope Forbes. She had her works exhibited in notable shows and won medals for her works. Her paintings are in collections of museums in Canada, United States and England.She came to England in the 1870s, chaperoned by her mother, to study art at the South Kensington schools. After a brief return to Canada due to her father’s death, her studies continued in New York, London and Munich. Elizabeth then sought artistic inspiration in Brittany (1882), Holland (1884) and Cornwall (1885), where she met her future husband. After a lengthy engagement, she and Stanhope married in 1889 and made Newlyn their home. Throughout her career, Elizabeth Forbes continually developed and changed her work in response to new stimuli. Before marriage, she had produced etchings influenced by Whistler and Sickert, while her early work in Newlyn bears the hallmarks of French realist painting. She is particularly known for painting pictures of children, including her own son, Alec. Elizabeth Forbes was a vibrant contributor to the art colony, exhibiting and selling more work than most of her male contemporaries. Sadly, she died of cancer in 1912, aged only 52 and her obituary mourned the loss of ‘the Queen of Newlyn’. Stanhope outlived her by 35 years (in 1915 he married Maudie Palmer, a former student of the Forbes’s School and friend of the couple).